Teams always need pitching, pitching, and more pitching. For the Twins fans, lack of pitching has been a complaint for many years. However, there may some hope on the horizon. Strong pitching performances have been a staple in the organization’s early minor league games. Let’s review the last week and see what minor league starters whose performances stood out. Stewart got the Opening Night start in Rochester. He actually struggled in the first inning as he allowed two runs (one unearned). He settled in from there and put up zeros for the next four frames. He finished the night with five innings by allowing one earned run on three hits and he struck out eight. Sammons took the mound in the Miracle’s first game. He labored a little but was able to pitch into the fifth inning. He scattered seven hits and only saw one unearned run cross the plate. He struck out five and walked two. Sammons wasn’t able to pick up the win, but he kept the Miracle close before the team’s offense exploded later in the game. After being rained out on Opening Night, Alcala took the mound in the first game of a doubleheader. He tossed five shutout innings and struck out six. He limited Mobile to three hits and he threw over 65% of his pitches for strikes. Last season, he made three appearances where he didn’t allow a run, but only one of those appearances saw him pitch five innings. Minnesota’s top ranked pitching prospect had a tough act to follow after Alcala’s strong start. He was still able to be very impressive including hitting triple digits on the radar gun. He allowed one run on three hits and pitched into the fifth inning (4 2/3 innings). He struck out six and walked a pair of batters. The 20-year old flamethrower made only 11 regular season appearances with the Miracle last season, so it might have been a little aggressive to push him to Double-A. It certainly seems like he can handle himself at that level. While Graterol was throwing heat for Pensacola, Duran was doing the same for the Miracle. Like Graterol, he hit triple digits on the radar gun. In four innings, he didn’t allow a hit and the lone base runner came on a walk. He struck out four and tossed 35 of his 57 pitches for strikes. As Tom noted in the TD Minor League Report, Duran’s career high for innings pitched is just over 100, so the organization will likely watch his innings in the season’s early action. Balzovic threw over 70% of his pitches for strikes in a very dominant performance. He allowed one run on four hits over five innings. The only run scored against him came in the third. A one out single put a runner on base before a two-out triple allowed the runner to score. He was able to collect nine strikeouts and he didn’t walk a batter. At one point in the game, he struck out six straight batters. Smeltzer was perfect through five innings of work. He wouldn’t make it out of the sixth frame, but he still put together quite the stat line. In 5 2/3 shutout innings, he allowed two hits and a walk. He struck out nine batters and threw strikes for almost 75% of his pitches (61 of 82 strikes). Last June, he had back-to-back starts where he pitched six innings or more and didn’t allow a run. This came before he was part of the Twins organization. Sands was drafted by the Twins last year, but he had yet to make his professional debut. The organization felt he had had enough innings during his college season at Florida State. His debut couldn’t have been much more impressive. He pitched five shutout innings without allowing a hit. He struck out eight and walked one. He sent the first 13 batters of the game down in order and struck out the first five batters of the game. Pensacola starting pitchers have been outstanding to start the season and that trend continued with Jax. He scattered four hits in 4 2/3 innings without surrendering a run. He struck out five and walked two batters. Runners reached base in every inning against Jax, but he was still able to keep Mobile off the scoreboard. Ober certainly made things look easy on Sunday. He pitched six innings, struck out 11, and walked only one. Charlotte could only muster four hits against him. The lone run scored with Ober on the mound was unearned. There were only three games last season where he reached double-digits in strikeouts. Now he’s already got one under his belt for 2019. Which pitching performance would you rank as the best? Leave a COMMENT and start the discussion. I'm still hopeful for Kohl Stewart. Excellent athlete, but he's just not a natural pitcher. He will need to work hard and long on every aspect of the pitching game, because nothing will come easy. That said, I still believe he can keep honing and sharpening his skills to the point that he may well perform like a "natural" pitcher, like Jose Berrios. Only thing is, Berrios himself works hard as a sled dog on his own game, too. That said, there are "natural" pitchers, guys that simply grow up with stuff that's almost unhittable. Walter Johnson had an effortless side-arm sling that amazed the world for twenty years. Other than a few guys that look like they're just skimmin' stones, most humans really have to work at their pitching technique. I hope the Twins coaches keep these learning hurlers from breaking their arms. Great to read this list! That's 10 starting pitchers with excellent first starts of the year.Is it realistic to HOPE that two or three of them make it to the Twins in the next two to three years and develop into pitchers that can do this on a regular basis? 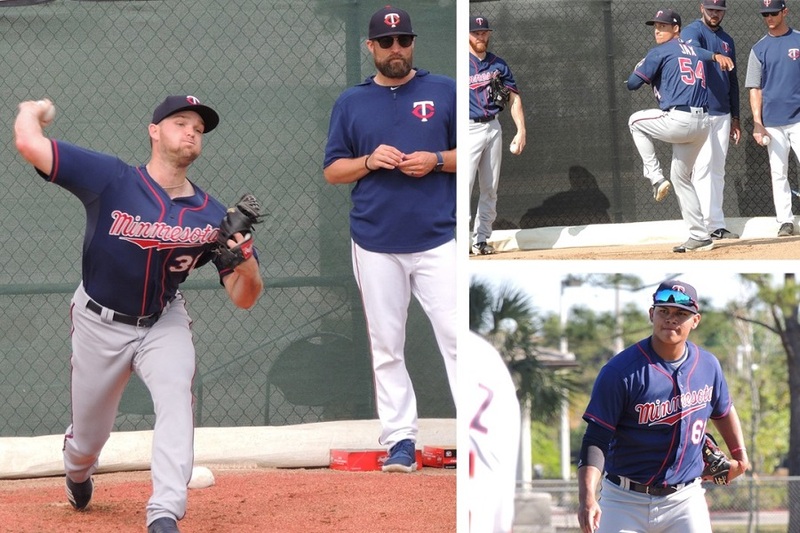 Wow...What encouraging starts to a minor league season for the Twins minor league pitchers. I really do enjoy reading about these minor league players. Only here at TD can this be done. This is an awesome website which is made possible by some dedicated, talented writers, who seem to be genuinely nice people. Thanks TD staff and writers! It's nice to see Kohl Stewart missing some bats. If he can increase the K's a bit while keeping that really high GB ratio, he's going to have success. Balazovic impresses me. He's definitely a guy to watch, and I'd give him the award on best performance on this list, but there's quite a few to choose from! In Baseball America recently, their list of the top milb 100, they pumped up Graterol and commented he was the best of a deep crop of pitching talent on the way up. Nice to read that. And nice to see such outstanding early performances to the season.